I know I'm not supposed to say this, but I'm really really tired of experts. I mean really tired. I can't stand so-called “Dream Teams” and their journalist promoters who give them credibility that is rarely deserved. As a journalist I have the luxury of deep diving into topics and every time I do I see experts who the media have boosted as “straight shooters” and “steely eyed professionals” very quickly turn out to be pandering, preening, thin-skinned showboaters. I know we are supposed to hate populism and feelings and bow to “evidence” and the experts that expound them but right across the board from Climate Change experts, to FBI/DOJ crack investigators, to political strategists who have gotten almost everything wrong it honestly is very difficult to treat these experts seriously. Take Climate Change and I wish somebody would. There are apparently a lot of experts who all agree on it. Or so we are told by journalists and such. Apparently there was time recently when the weather was perfect – absolutely perfect. None of the experts, the Dream Team, have yet to say what this perfect weather was or where it was but apparently it existed and then we apparently destroyed it and according to the experts and we must pay for this. And, again according to the experts, it is only Americans corporations that must pay. Indian coal companies and Chinese factories are good but American oil companies are evil, the experts agree. And all the journalists agree – so much so that a number of newspapers have stated they will no longer carry any reports from those who are skeptical of these experts. The LA Times even said they would no longer publish letters to the editor that questioned climate change. In other news the LA Times journalists just unionized to try and stop mass layoffs because no one is reading their newspaper any longer. 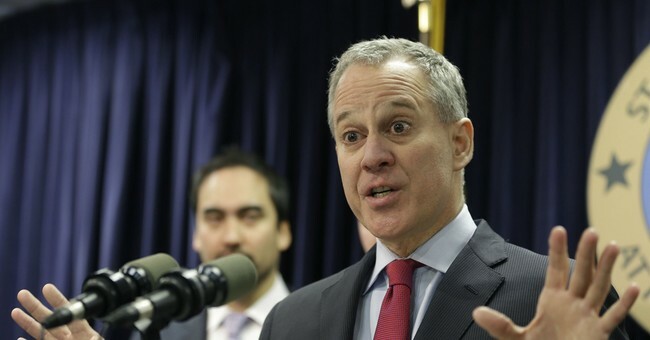 Obviously Attorney General Schneiderman is an expert on assault by highly aggressive and morally vacant forces so it was up to him to take the lead. He launched his lawsuit and it has been followed by similar legal attacks in California and Colorado. In California the oil companies fought back and Judge William Alsup, a Clinton appointee, decided he wanted to know more and asked for a “ courtroom tutorial” on the history of Climate Change in advance of the main trial. This was a chance for the Climate Change Experts to be the experts their side have always wanted them to be. Except it didn't quite work out that way for the Climate Change dream team. The tutorial was deemed the Scopes Monkey Trial of Climate Change science. The mainstream media salivated believing their experts were going to banish the skeptics, or so they thought. Oxford physicist Myles Allen, was the first expert witness and he was such an inexpert expert that the judge criticized him for coming to court with a completely misleading illustration to represent carbon dioxide in the atmosphere and a graph that he claimed showed temperature rise that did not actually show rising temperatures. Even more embarrassing was local expert Gary Griggs, an oceanographer at the University of California, Santa Cruz, who could not answer the judge's simple question about what caused the last Ice Age. Yes the experts who were supposed to impress us with their expertise about man made climate change couldn't even get their graphs right and spent an awful long time showing that the most apocalyptic weather the earth has ever known existed long before American oil companies were ever on the earth. And so it is with almost every expert, every dream team. They are built up by a monochromatic groupthinking media only to be worse than useless if they ever face a genuine spotlight. On the Mueller investigative team with Page was senior FBI operative Peter Strzok. Both were married to other people but were having an affair with each other which seemed to have gone unnoticed among their colleagues who are supposed to be the nation’s top investigators. Strzok and Page also thought it would be okay to exchange anti-Trump and condescending, insulting comments about their fellow Americans in texts on their work phones. Page and Strzok, two of America's elite law enforcement operatives, also texted openly their contempt of President Trump and described his supporters as ignorant hillbillies. They talked about how they hated pro-lifers and after Trump was elected said they were re-reading All The President's Men – the book about how an FBI investigation took down a president. And of course throw in a bit of Dream Team racism. Romanians are an awful people, “sleazy...with the crookedness of the Russians with the entitledness of the Italians. Yuck,” they told each other. Reading the texts is like reading a lovestruck 13-year-old’s diary with a dash of wannabe James Bond. If you want to spend a few cringeworthy minutes I have produced a short film with actors reading the juiciest texts – verbatim (www.FBILovebirds.com). The re-enactment is painful, compelling viewing. It’s also very funny but it is frightening to remember that these two are/were considered the very best of the best, they stood and stand between us and the many enemies of our security and they were sworn to protect us. Instead they spent hours and hours during their working days bitching like teenagers about who they did or didn’t like that particular day, hate Trump, love Comey and complimenting each other on how brilliant they were themselves. That this is the way senior FBI agents conduct themselves, is shocking. But worse, it’s dangerous and a cringeworthy reminder we should never blindly trust experts, especially when the media tells us we should.